Katie and Simon are coming on a special trip from the Adventure Bureau, an ancient organisation whose job it is to create all the adventures EVER! 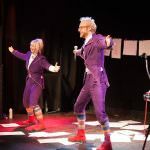 With the help of your biggest (and smallest) ideas, they will weave a totally improvised story complete with an improvised soundtrack and songs. The audience decides what elements go into the bursting story melting pot, but who knows what will come out!? Katie Storer is a performer, writer, facilitator, and director. She performs regularly as a clown, fool and storyteller. Her stories take the audience on bizarre and magical journeys using ludicrous physicality and rambunctious characters to end up in places that no-one would ever have expected! When she’s not spinning ridiculous yarns, she is found in the rehearsal room with young people leading workshops and creating shows for companies such as the Bristol Old Vic and Travelling Light Theatre Company. Simon Panrucker is a comedian, musician and filmmaker. For the past four years, Simon has worked as a composer writing music and songs for Cartoon Network’s hit show Clarence as well as for other shorts produced by Cartoon Network, Nickelodeon, and Titmouse Inc. In his personal work, he performs high-octane comedy shows fusing original music, improvisation, physical theatre and tongue in cheek fun for everyone. Simon has previously been commissioned to write music for BBC Radio 4’s Word of Mouth and Channel 4’s Mashed.